Many women experience hormonal imbalance some time during their life. Hormonal imbalance is not exclusively associated with menopause. Hormone imbalance is most often mentioned in connection with menopause, yet many other conditions are associated with menopause. These include PMS, infertility, anxiety, depression, migraines, obesity, Endometriosis, thyroid conditions, Polycystic Ovarian Syndrome and even certain cancers. The ovaries produce estrogen and progesterone, beginning in puberty. These hormones play a key role in regulating, not only a woman's menstrual cycle, but also many other physiological processes. Both estrogen and progesterone rise and fall at different points throughout the month and throughout a lifetime. Synergistically, these hormones provide a natural hormonal rhythm. Changes in this natural rhythm can have a dramatic effect on health. Symptoms associated with a hormonal imbalance in women frequently include mood swings, irritability, depression, tiredness, mental confusion, weight gain, food cravings, insomnia, headaches and hot flashes. Other factors such as stress, the use of certain medications, exercise and diet also influence the balance of female hormones. It is because of these symptoms of hormonal imbalance that many women seek solutions to treat their hormonal imbalance. 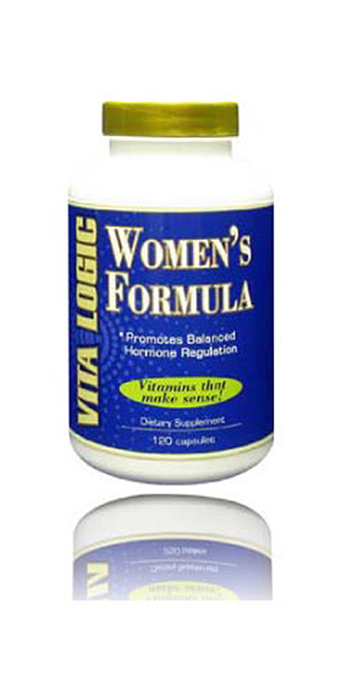 Due to the negative press that traditional hormone replacement therapies has received in recent years, more and more women are looking for natural herbal remedies, such as Women's Formula. Red Clover has been proven to be beneficial for balancing hormones by reducing the severity and frequency of menopausal symptoms. Studies have also shown that red clover increases the activity of bone building cells and could therefore minimize the effects of osteoporosis. Supplementation with Red Clover has been associated with a significant increase in high-density lipoprotein (HDL) cholesterol, which provides protection against cardiovascular disease. Black Cohosh has been shown to significantly reduce symptoms of depression and anxiety better than estrogen replacement therapy or some prescription medications. Furthermore, black cohosh has been shown to reduce hot flashes, alleviate menstrual cramping, vaginal membrane thinning and dryness, normalize menstrual cycles, prevent bone loss and even reduce the growth of certain types of breast cancer. Terzic, M.M., Dotlic, J., Maricic, S., Mihailovic, T. and Tosic-Race, B. (2009) Influence of red clover-derived isoflavones on serum lipid profile in postmenopausal women. J. Obstet. Gynaecol. Res. 35:1091-5. Geller, S.E. 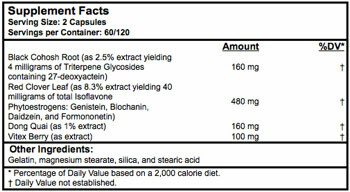 and Studee, L. (2005) Botanical and dietary supplements for menopausal symptoms: what works, what does not. J. Womens Health 14:634-49.